Listen to this track by L.A based singer-songwriter and orchestral pop purveyor Carolyn Edwards. It’s “Leave ” (AKA “Leave This Alone”), a tale of love just out of reach, and taken from Edwards’ 2005 eponymous Carolyn Edwards. The album captures the feel of late 60s pop from Bacharach/David, Jimmy Webb, and Carole King. It doesn’t take a medium to detect the spirits of Judee Sill and Laura Nyro floating into and out of this tune. You can also tell that Edwards is happily aligned to that chapter of pop music history, while giving the songs room to breathe in a modern context. With this one, a song about how longing and yearning to commit to a loving relationship is often met with the barriers of another’s baggage, the themes are decidedly timeless. The Delete Bin: This song, “Leave ” is cinematic, with little girls dreaming of impossible things, and men who are too afraid to fall in love. How much does the act of storytelling come into your songwriting process in general? Carolyn Edwards: It depends on the song. Some of my songs, like “Leave” and “The Argument” tell a specific story, whereas some of my other songs like “Beauty Wasted” rely more on a series of images to create a certain mood. DB: The late 60s classic orchestral pop sound is a clear point of the musical compass for this song. What is it about that aesthetic that most attracts you? CE: It’s part of my musical DNA. I was raised on the the Monkees, the Partridge Family and all those fantastic AM hits of the early 70s, as well as the pop standards and musicals from the 30s and 40s. 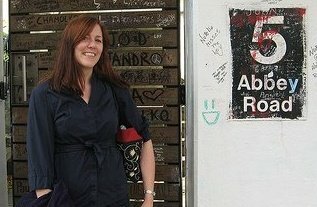 When I was about 13, I became obsessed with the Beatles, like most of us have at some point. Nowadays, I’m attracted to bands like Belle and Sebastian, Magnetic Fields and Arcade Fire who often employ that orchestral aesthetic. DB: Apart from a song like the Lennonesque “Soul Peeler”, your music is centered around the piano, which is a less traveled route in indie music, it seems to me. Do you see the use of the piano becoming more popular for the indie crowd? CE: “Soul Peeler” is a much older song, which explains its guitar-driven sound. I co-wrote it with the former leader of my old band, 3D Picnic, around 1989. It appears on 3D Picnic’s album Sunshine and Cockroaches released on Cargo in 1990. I played both guitar and keyboards in that band, as well as writing and singing lead on some of the material. After that band broke up in 1992, I formed a band called Spindle [ed: not to be confused with the band based in Bellingham WA, of the same name] with bassist Greg Mora (who was later in the band Fluorescein). Spindle was very guitar-driven, and I didn’t play keyboards at all; I sang lead and played rhythm guitar. In retrospect, that decision seems odd to me, because my rhythm guitar playing is somewhat limited, whereas I’m an accomplished pianist. I think I was just trying to be a 90’s rock diva with a guitar; it was fun for a while. The move to piano seemed completely natural to me, since it’s the instrument I know how to play really well, and I’d gotten the 90’s rock diva thing out of my system. As far as whether or not piano will become more popular for the indie crowd – I have absolutely no idea what the whims of the indie crowd are. One of the nice things about not doing music for a living is that I can be selfish about it, and create music solely for my own enjoyment, on my own time, without worrying what the current trends are. Of course, the downside to that is that my next CD probably won’t come out for another 10 years! DB: You’ve surrounded yourself with a number of supplementary players in order to achieve your sound, calling yourself a ‘benevolent dictator’. How does this set-up translate into a live setting? CE: Very precariously! I don’t play out live very often, but when I do, it’s usually in the lounge of a French restaurant in Echo Park called Taix. Space for the band is very tight – elbows are poked into faces, heads are in danger of being struck by guitars, cords are tripped over, drinks are spilled, etc. And there’s no stage to speak of; we are at eye level with the audience. This can be both good and bad – it’s an intimate audience, I can make eye contact with them and see that they’re enjoying the show; but there are always a few drunk, loud people at the bar who aren’t watching or listening; that can be distracting. DB: Tell me about the business of arranging the songs, which it seems to me you’ve put a lot of emphasis on, given the use of strings along with traditional pop instruments. CE: I will often have specific melody lines and harmonies that I want, and I fortunately work with musicians who are nice enough to play or sing them for me. For example, I wrote the middle string/horn section of “Factory Moon,” and the intro to “Secret Monster,” which Probyn Gregory (from Brian Wilson’s band) played on various brass instruments. I’ll also often hear specific bass and guitar lines in my head. But then there will be songs where at least part of the song is open to interpretation, where I’ll either give the musicians a loose idea of what I want, or I’ll ask them to come up with something on their own. The co-producer of my album, Steve Stanley, came up with some nice touches, such as the sleigh bells on “Beauty Wasted” and suggested the mute on the trumpet for “Solace.” Probyn, came up with the horn line on the verse of “Secret Monster,” as well being an insanely talented musical guru in general, offering sage advice.. Heather Lockie from Listing Ship wrote a fantastic string chart for “Leave” and played all the strings. And Nick Walusco (the mix-down producer, also from Brian Wilson’s band) added the marxophone and jug bass to “Monica” just for fun, when he was working alone in the studio. I ended up loving it!. DB:You’ve got a background in music publishing, and therefore a unique perspective from seeing things on both sides of the desk. What have you picked up from that background, as a songwriter and working musician? CE: I’ve learned that I can make a living from music publishing, but not from my own music. I tried for years to make a living from music by embarking on the “getting signed” route. It’s what bands did in the 80s and 90s, before the Internet changed how bands can market and distribute their music. If I had all the money now that I invested in bands over the years, I’d have enough to buy a house! But it was also a great learning experience, and I don’t have any regrets about it. DB: And as far as the whole ‘getting signed’ thing went, what were your experiences? CE: My former band, Spindle, was very close to getting signed to Interscope around 1992. We had a devoted, hardworking A & R guy from the label who tried his best, but Tom Whalley and Jimmy Iovine ultimately passed on the demo. I’m proud that we even got that far. After Spindle broke up, I really wanted to settle down, have a steady career that I genuinely liked, and not have to lug my equipment to rehearsal three times a week. I’d turned 30; it was all part of growing up. Working full time, while constantly rehearsing and playing late nights in clubs, wasn’t rewarding anymore. I had no time to do normal, fun things in life that everyone does, like go hiking or out to movies with friends on the weekend. DB: How did getting off the traditional ‘getting signed’ treadmill affect your life and approach to making music? CE: It was really nice to not have that band obligation hanging over me, and when I started playing music again, I enjoyed it more than I had in years. I’ve learned that the struggling artist scenario does not suit my personality very well. I’m really sort of a square and not very bohemian at all, at least not in lifestyle. Music is a luxury to me that I do in my limited spare time, and I try not to take it for granted. 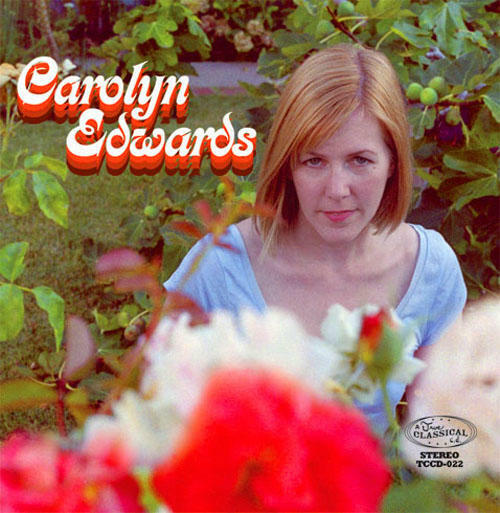 For more information and music, check out the Carolyn Edwards MySpace page. You can also ‘Like’ Carolyn Edwards on Facebook.